The fight for customer attention is fierce and companies are increasingly turning to technology to discover new ways to help. Artificial intelligence is playing a major role in creating connected customer experiences throughout the entire customer lifecycle. 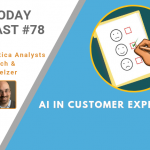 In this podcast hosts Kathleen Walch and Ron Schmelzer explore various ways AI is improving the customer experience.